Today’s post is written by Alex Parker, a research scientist at the Southwest Research Institute in Boulder, Colorado, working on NASA’s New Horizons mission. Pluto and its moons are the most distant worlds ever visited by any of humanity’s robotic explorers, but for how much longer will that remain true? New Horizons is outbound through the Kuiper Belt, and two years ago today we discovered a smaller, more distant world that we could send it to. Likely an icy relic left behind from the era of planet formation, this world lies nearly a billion miles further from the sun than Pluto. While it will eventually be named something befitting such a world, it is currently designated 2014 MU69, and if New Horizons’ extended mission is approved by NASA, it will become the new most distant world ever explored on Jan. 1, 2019. 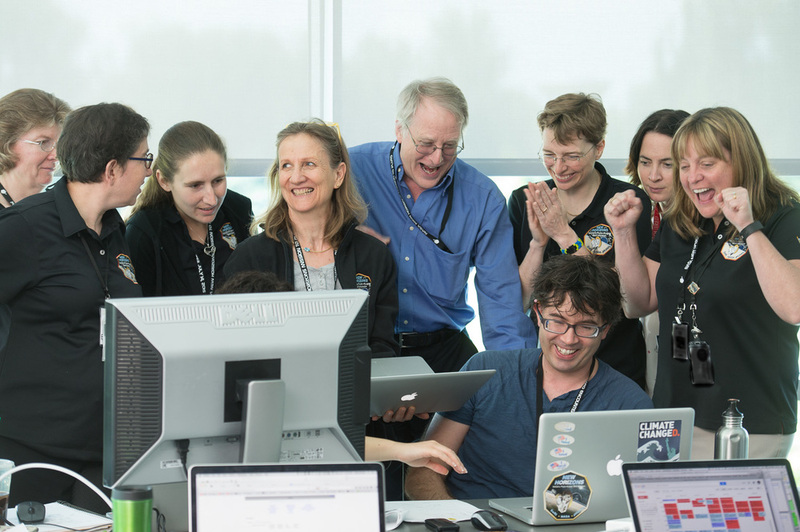 It took years of effort from a dedicated team to find somewhere that New Horizons could visit after Pluto. We scoured the southern skies with Earth-bound and space-borne observatories, battling poor weather, unforeseeable hardware faults, and the endless interference of the dense star fields of Sagittarius, at the very center of our home galaxy itself. That search discovered over 50 new Kuiper Belt objects, and culminated with the discovery of New Horizons’ potential post-Pluto target, 2014 MU69. What follows is a brief look back at that search, the discovery of 2014 MU69, and what it portends for the future of New Horizons and outer solar system exploration. 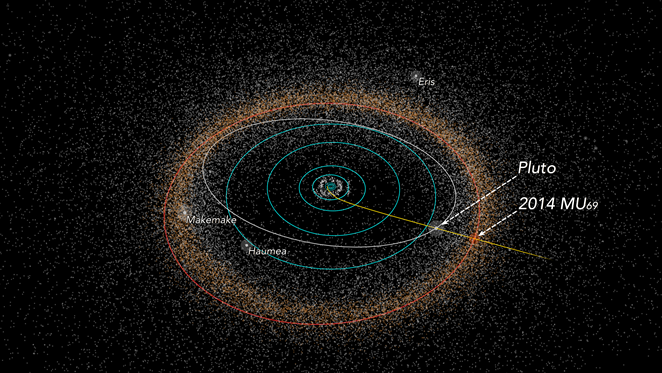 Finding New Horizons a post-Pluto target in the Kuiper Belt was a long-standing mission goal. It was even included as a component of the original mission proposal in 2001 that New Horizons have the capacity for exploring a more distant Kuiper Belt object, should one be found that it could reach. That last bit was the catch — at the time that New Horizons was designed, assembled, and launched, there were no suitable Kuiper Belt objects known near enough to the path that it would take out of the solar system for it to reach one after Pluto. Given that the first decade of the 21st century saw the peak rate of new Kuiper Belt object discoveries in all of history to date, why weren’t more known in the region of sky around Pluto? Because that area of sky is one of the hardest to search for Kuiper Belt objects. It lies in front of the center of our galaxy and is packed full to brimming with background stars. For every Kuiper Belt object as faint as 2014 MU69 in our images, there were tens of thousands of stars far brighter. Additionally, there was a quirk to the search that made waiting preferable: the longer we waited, the less sky we would have to search. You can imagine the swarm of possible Kuiper Belt objects that New Horizons could reach, all orbiting the sun on different paths with one common feature — those paths intersect with the path of New Horizons. As you go backward in time from the period during which New Horizons is passing through the Kuiper Belt, the paths of these Kuiper Belt objects diverge from one another, and they spread out like a dissipating cloud across the sky. The earlier we performed the search, then, the more sky we would have to cover in order to find these Kuiper Belt objects. 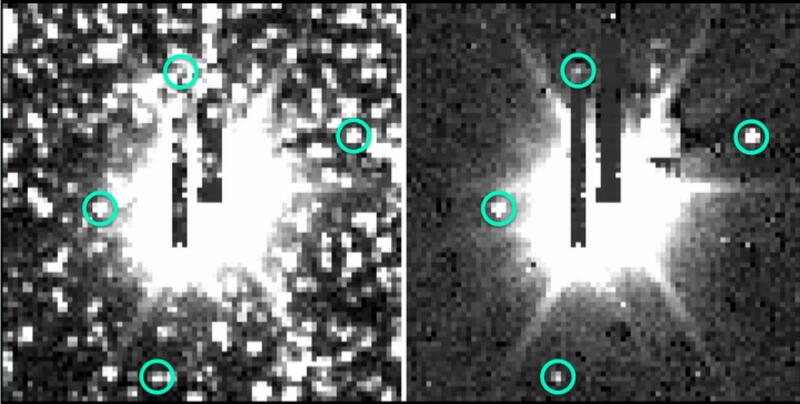 The first searches for a post-Pluto target were performed in 2004 at the Subaru observatory. At the time, the swarm of Kuiper Belt objects was quite spread out, so the search was performed over a relatively large area of sky without spending too long in any one area. These data were a large part of what was searched by the IceHunters citizen science effort, and a number of relatively bright Kuiper Belt objects were discovered in it, though none were within reach of New Horizons. I came into the project in 2011, with our first Magellan observatory survey. The twin Magellan telescopes are situated adjacent to one another atop Las Campanas in Chile. While slightly smaller telescopes than Subaru, their site delivered us some of the best atmospheric conditions of the entire search. Since it was later than the first Subaru search, we did not have to search as much sky to cover the full swarm of targetable Kuiper Belt objects. This meant we could spend more time on each area, and see fainter Kuiper Belt objects. But the challenge of the Milky Way remained. Above is an example of what just a portion of one of our raw images looks like. 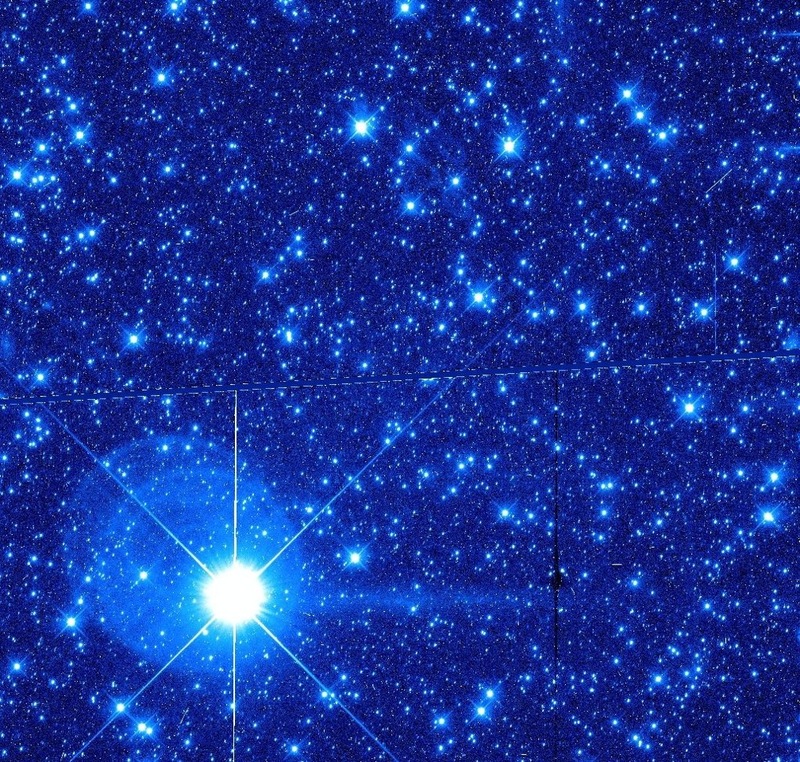 Every star you can see in this image is many times brighter than the other Kuiper Belt objects we were looking for. I joined the search as a postdoctoral researcher at the Harvard-Smithsonian Center for Astrophysics in 2011. There I was working on ways to suppress the stars in our images while leaving behind any and all objects that move like Kuiper Belt objects. These methods also had to compensate for the constantly-shifting blurring caused by the Earth’s atmosphere. With lots of nights at the telescopes in Hawaii and Chile, lots of algorithm and code development, lots of CPUs crunching through the data, and lots of time spent scrubbing through the results manually to make sure nothing was missed, we turned up dozens of new KBOs between 2011 and 2013. Yet, while many of them came close to New Horizons’ path, still none of them were quite within reach of its fuel supply. Time was growing tight, and we had to make a decision. We needed to not only find a targetable KBO, but we also needed to track its orbit over a long enough period of time that we could predict where it would be with the accuracy needed to target New Horizons for a hair-raising few-thousand-kilometer flyby. The longer we waited, the easier the search was to do, as the diffuse swarm of potentially-targetable KBOs slowly collapsed into a tight spot on the sky as the encounter dates approached. However, the time remaining for accurate follow up and orbital measurement got ever shorter. 2014 balanced both of these needs. It was the last year in which enough time remained to accurately measure any KBOs’ orbits well enough to target them with New Horizons, and it was late enough that the area of sky covered by potential targets had shrunk to the point that Alan Stern, the principal investigator of New Horizons, indicated that it was time to consider using our weapon of last resort: NASA’s Hubble Space Telescope. Hubble has unrivaled sensitivity, and since it orbits above the Earth’s atmosphere, its unobscured view would permit us to search for KBOs hiding in front of our galaxy. The millions of background stars we had been contending with would be far less trouble for Hubble’s sharp vision. That said, we knew that the survey we were asking for had no precedent. It would be the largest dedicated search for solar system objects ever conducted with Hubble. It would need to be designed with the utmost care, it would need to execute flawlessly, and the solar system would need to cooperate with us. And we would need to convince a panel of reviewers that this survey’s potential value outweighed the risk of coming up empty after investing so much of Hubble’s time. As you might imagine, a request for the amount of Hubble time we needed could not be taken lightly, and the proposal was not a slap-dash affair. We painstakingly developed a risk-mitigating strategy that would both ensure our best chance of success while minimizing the amount of precious telescope time that would be wasted if the solar system did not cooperate by providing us with a targetable Kuiper Belt object. Part of that strategy was a two-part search. 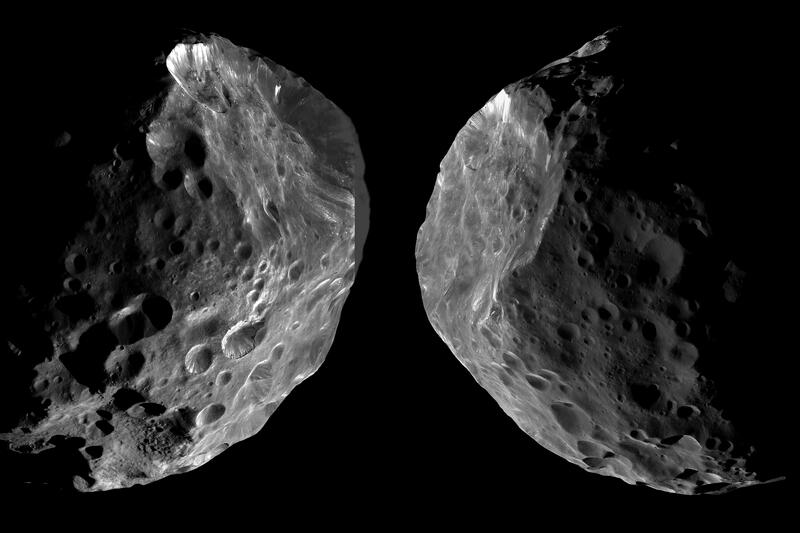 We would perform a pilot project and prove that we could discover as many Kuiper Belt objects as our models predicted before proceeding with the larger main survey. We had a tight deadline to deliver this proof, with about two weeks to analyze this unprecedented new dataset, deliver our new discoveries, and pass the go-no go threshold for the full program. With this strategy in place, we were awarded the time. And that was when things got really interesting. In mid-June of 2014, we learned that our proposal had been selected, and that it was scheduled for immediate execution on Hubble. I quickly booked a flight to Boulder to join the rest of the team for the push to beat the tight demonstration deadline. I arrived in Boulder just as the first of the data was being collected by Hubble, orbiting somewhere far overhead. I didn’t know it at the time, but the intense search effort that followed was a preview of what the following summer would be like as New Horizons flew by Pluto. There was no good demonstration data to tune our tools on, which meant that we went in cold and had to write our analysis software on the fly. We were developing new software and refining the speed and sensitivity with which we could handle the data as it streamed down from space. We had to convince energy-conscious building managers to keep the HVAC running late into the night and over the weekends to keep the offices and server rooms at livable temperatures during the summer Colorado heat. In parallel, there was another team on the East coast working to make sure that an independent and redundant pipeline was developed and running. We checked each teams’ performance by placing synthetic KBOs of known brightness in the data and determining how faint they could be before our software stopped finding them reliably. It was exactly two years ago – on June 28, 2014 – that our search first bore fruit. 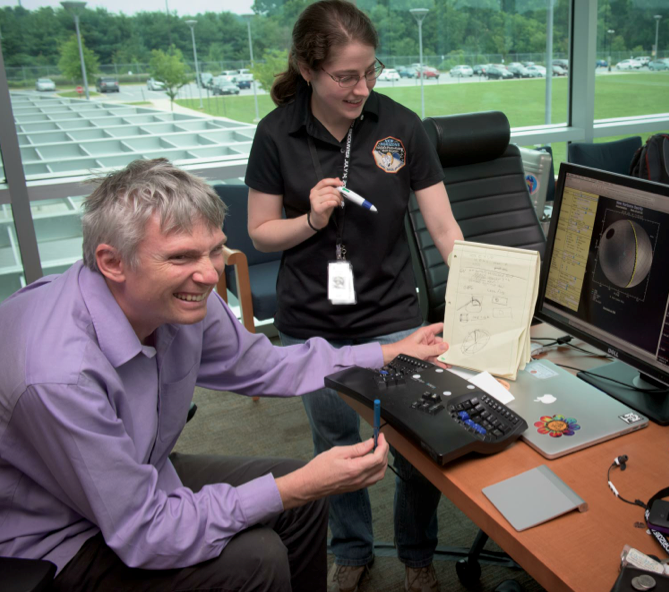 Marc Buie alerted the Boulder team that he had spotted something in the data, and subsequent analysis by all the involved teams confirmed that it was a Kuiper Belt object. Eventually, this first discovery would be designated 2014 MU69. We quickly found another Kuiper Belt object, and passed the go-no go. After all was said and done, we found five new extremely faint Kuiper Belt objects in this search data, with three candidates with promising orbits that might make them targetable. The discovery observations alone were enough to suggest that 2014 MU69 might be targetable by New Horizons, but it would take further follow up to confirm it. In August of 2014, a batch of Hubble observations picked up 2014 MU69 again, and with those new observations my analysis of the orbit concluded that it was guaranteed to be targetable given New Horizons’ fuel reserves. Even if no others panned out, we had a world we could reach. In the end, two of the five candidates withstood the test of subsequent observations. Of those two, it was still the first that we discovered that remained the best candidate, and so it was that 2014 MU69 was selected as the nominal target of a potential New Horizons extended mission. But just discovering a targetable world was not enough. Pluto had been tracked for 85 years—well over a third of its orbital period, before New Horizons arrived. 2014 MU69 lives deeper in the Kuiper Belt than Pluto, and takes nearly 300 years to orbit the sun. We only discovered it two years ago. By the time we fly by it, we will have known about it for only one and a half of one percent of its orbital period. This short baseline of observations means that in order to predict the position of 2014 MU69 with sufficient accuracy and precision to fly a spacecraft by it, we would need exquisitely calibrated observations between now and the flyby. Since its discovery, we have continued to track 2014 MU69 with Hubble. Once these extremely accurate observations are linked with the extremely precise GAIA astrometric network, we will have an orbit solution for 2014 MU69 that is unparalleled for the period of time that it has been tracked. From its orbit, we have already learned that 2014 MU69 is a very intriguing kind of Kuiper Belt object. It belongs to the “Cold Classical” Kuiper Belt, a population that appears to be a surviving remnant of the disk of material from which the planets formed. The cold classicals seem to have escaped much of the violent processing that other kinds of minor planets were subject to. This makes 2014 MU69 the clearest window into the era of planet formation that we have ever had the chance to see up close. All of our effort in finding 2014 MU69 opened the door to a potential extended mission for New Horizons. After the Pluto flyby in the summer of 2015, we and the spacecraft and navigation teams designed the largest spacecraft maneuver ever performed beyond Neptune. This maneuver would adjust New Horizons’ course to intersect the orbit of 2014 MU69 on Jan. 1, 2019. It would also be the largest series of engine burns New Horizons had ever attempted. The maneuvers to do this began in October of 2015, and took several weeks to perform. After it was complete in November, New Horizons had 2014 MU69 in its sights. We were on our way. 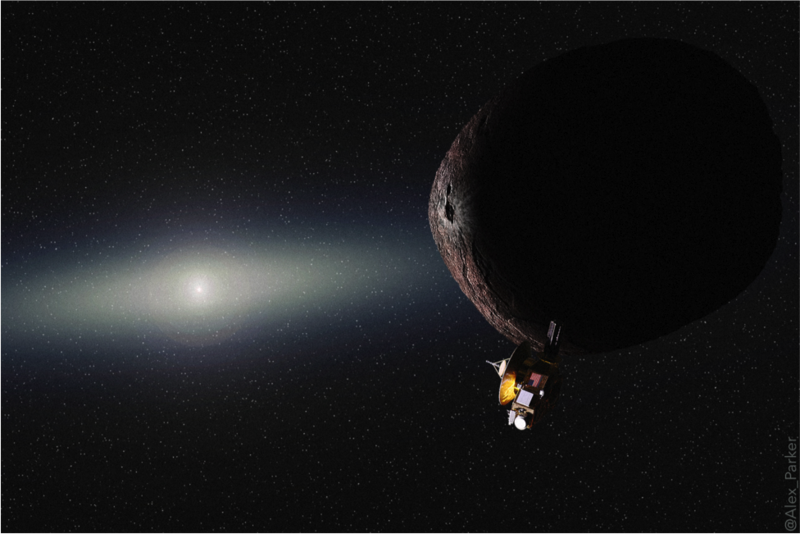 New Horizons has targeted 2014 MU69, and we have proposed to NASA for an extended mission that would support the flyby of this distant world. This extended mission proposal is still under consideration. If approved, we will not only explore 2014 MU69, we will also study about 20 of the other Kuiper Belt objects that we discovered in our ground- and space-based searches. We won’t approach these worlds nearly as close as 2014 MU69, but New Horizons’ unique vantage point still makes it possible for us to examine them in more detail than is possible with any other facility. Then, on Jan. 1, 2019, New Horizons will cruise over the surface of 2014 MU69, and the speck that we spotted in Hubble’s images two years ago will turn into a real world before our eyes. 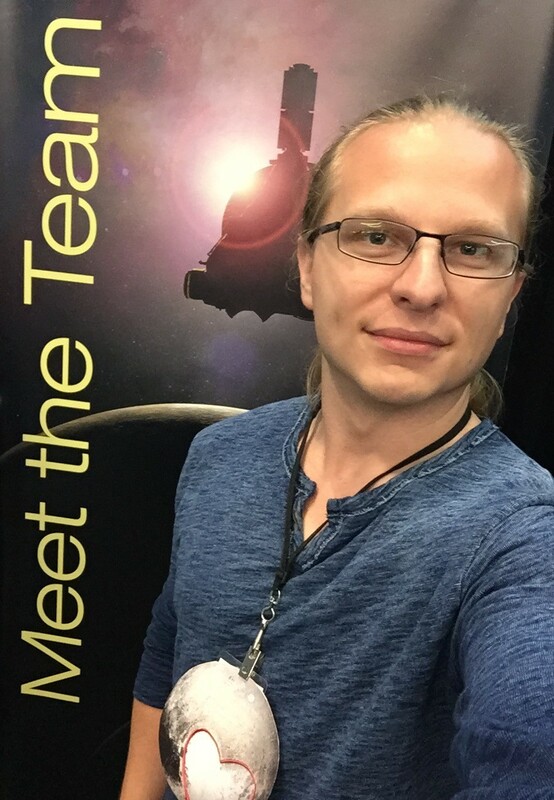 Hi, I’m Simon Porter, a postdoctoral researcher on NASA’s New Horizons mission. In this blog post, I’m going to talk about our observations of the Kuiper Belt object (KBO) called (15810) 1994 JR1, or simply ”JR1,” with the New Horizons spacecraft. New Horizons flew past Pluto nearly a year ago and has been sailing through the Kuiper Belt ever since. In November 2015 and April 2016, we used the telescopic Long Range Reconnaissance Imager (LORRI) on board New Horizons to take pictures of JR1 as we flew past it. This was our first “distant flyby” of a KBO (about 66 million miles, about as close as Venus is to the sun), and the first-ever distant observation of a KBO from the Kuiper Belt. We were able to get a huge amount of science out of these images, and they may be a preview of things to come as we observe many more KBOs this way, if an extended mission is approved. We first observed JR1 at the start of November 2015, taking four sets of 10 images, spaced one hour apart. It was even farther away at that time (172 million miles), and because of an error in targeting, it ended up on the side of picture frames instead of in the middle. However, JR1 was visible in all 40 images, dancing slowly across the field of view. In addition, we pointed the Hubble Space Telescope at JR1 in early November, so that it saw JR1 at almost the same times as New Horizons, accounting for the five hours that it took JR1’s light to reach Hubble. This was the longest-baseline parallax observation ever made – another record for New Horizons! –and allowed us to really improve our knowledge of JR1’s orbit. With this new orbit in hand, we pointed the spacecraft to image JR1 again this past April 2016. This would be the closest that New Horizons got to JR1, and we commanded the spacecraft to take lots more pictures than we had in November. We started with two “deep” sets of 24 images each, which could be added together to pick out any moons around JR1. We had already looked at JR1 with Hubble and saw no moons, so it was no surprise to find none in the New Horizons images, but it was worth a check. The ghostly circular pupil image and the little dots that are moving around in the image (and that aren’t JR1) are scattered light from a nearby bright star. LORRI isn’t that big of a telescope – just a little bit smaller than an 8-inch Schmidt-Cassegrain an amateur astronomer would use – so it’s easy for scattered light to bounce around inside the telescope and cause artifacts like these. The next sets of observations were to see how the brightness of JR1 changed over time. The first was a sequence of nine sets of three images, spaced half an hour apart, while the second was similar, but an hour apart. We got the half-hour sequence down first and were thrilled to see that it looked like a sine wave! If you are looking an elongated object (say, a tennis shoe) on the side and then turn it to look at the front, the apparent size of the object, from your view, will go down. Turn it back to the side and the apparent size goes up again. Now imagine the shoe is a thousand miles away and someone is turning the shoe for you. You wouldn’t see the shape of the shoe change (because it’s just a point of light), but the brightness of the shoe would change because it can reflect more light to you when you see the side than when you see the front. Making measurements like that is called making a lightcurve. When we do that, we see the brightness of asteroids, KBOs and moons change and we can infer what their shape must be, without actually ever having seen them up close. The second, longer set of images confirmed this variation and allowed us to determine the rotational period of JR1 was 5.47 hours—something that had ever before been measured. That’s pretty fast for a KBO this size, most of which spin at half this speed. Unlike asteroids, the sun is too far from KBOs to spin them up with solar radiation, so KBO spins mostly record the collisions that they have had with other KBOs. Since JR1 is spinning so fast, it probably had a pretty big glancing impact at some time in its distant past. 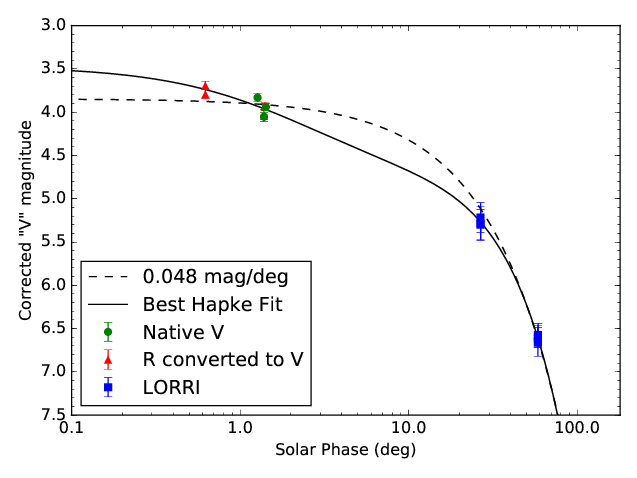 Lightcurves and deep images could be taken with Earth-based telescopes, but what no telescope other than LORRI could do is see a KBO from the side. From the KBO’s perspective, Earth is always a few degrees away from the sun, which means that from Earth we always see KBOs at high noon, with no shadows. 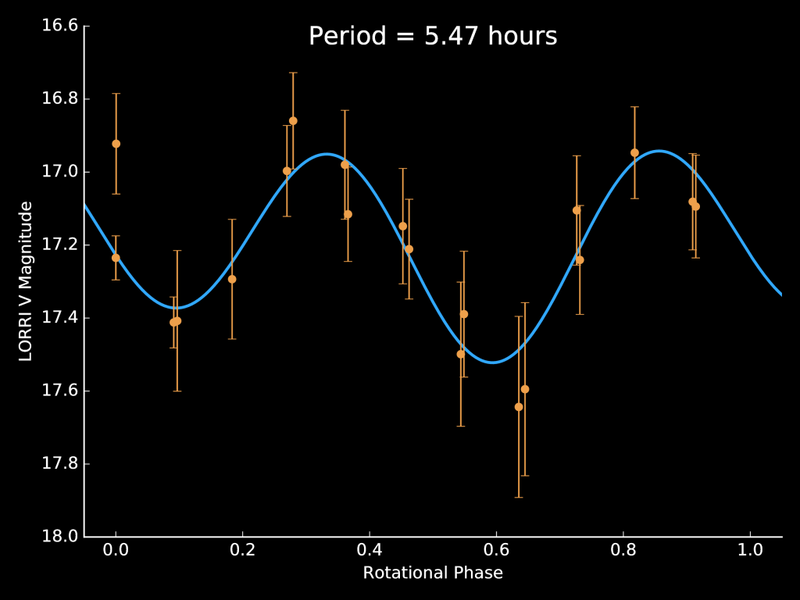 From a spacecraft in the Kuiper Belt (like New Horizons), we can look at different times of JR1’s day. The November observations of JR1 were either late morning or early afternoon (we don’t know, because we don’t know if JR1’s pole points up or down). 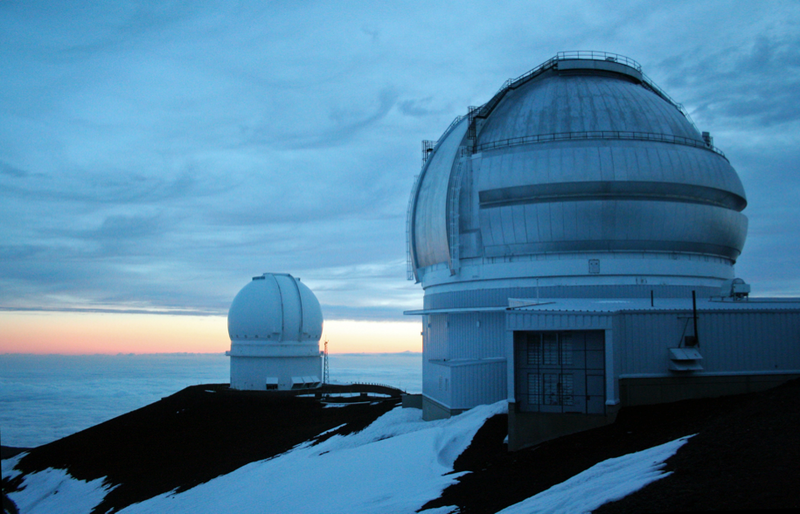 The April observations were at either early morning or in the late evening on JR1. Both of these times should have had shadows on the surface, especially the April observation. Sure enough, when we put all the brightnesses together in a time series, we found that there was enough dimming from shadows that the surface must be at least as rugged as Saturn’s rough-surfaced moon Phoebe. This makes sense, as Phoebe is thought by some to be a captured KBO, and is therefore probably our best guess for what (15810) 1994 JR1 looks like. Finally, our April observations were the closest-ever of a KBO (other than Pluto), and we used that fact to refine the orbit of JR1. From Earth, we can predict the motion of a KBO as seen from Earth very well, but can’t as well predict how far away it is. Because the New Horizons observations were taken at a very different angle to how the Earth sees JR1, we were able to drop the uncertainty of how far JR1 is from the sun (and thus Earth) from around 60,000 miles (100,000 kilometers) to around 600 miles (just under 1,000 kilometers). That’s a huge improvement in JR1’s orbit, and should enable other astronomers to predict when JR1 will go in front of stars, a measurement we call an “occultation” (from the Latin word for “hidden”). Observing an occultation of JR1 would allow a measurement of both its size and shape. Having this high-precision orbit in hand also allowed us to make a computer simulation of what JR1’s orbit will do in the future, and did in the past. JR1 is a “plutino” (pseudo-Italian for “little Pluto”) because, like Pluto, it goes around the sun three times for every two times that Neptune goes around the sun. In fact, JR1 is only 2.7 astronomical units (AU) away from Pluto – an AU being the average distance between the sun and Earth, about 93 million miles (or 149 million kilometers) – which is pretty close on outer system scales (it’s 35.5 AU from the sun). However, the orbits of Pluto and JR1 are different enough that this close encounter is cosmically fleeting, only lasting a few hundred thousand years, and not coming together again for another 2.4 million years. Pluto does have a gravitational effect on the orbit of JR1, but it’s mainly to add a bit of chaos into JR1’s orbit, causing it to be unpredictable over timescales longer than about ten million years (again pretty short, cosmically speaking). The primary mission of New Horizons will end this year, when it is finished downloading all the data from the Pluto system. NASA is currently deciding whether or not to approve an extended mission for New Horizons to do a close (within 6,000 miles or 10,000 kilometers) flyby of a KBO even smaller than JR1. If approved, this would also enable New Horizons to observe dozen more KBOs in a similar way to JR1. Today’s blog is from Henry Throop, a New Horizons science team member and senior research scientist with the Planetary Science Institute in Mumbai, India. 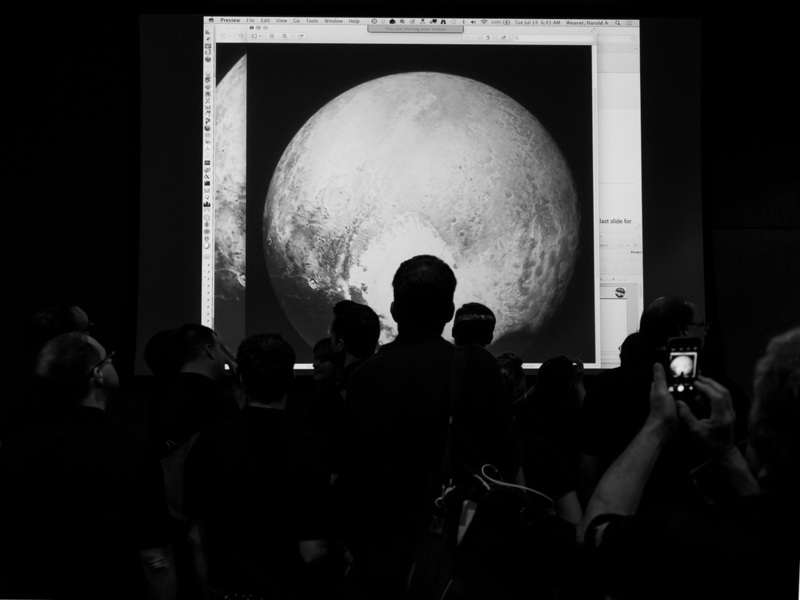 In a previous blog post, I wrote about software the New Horizons team used to image Pluto. Here, I’m going to talk about my work photographing the team itself. 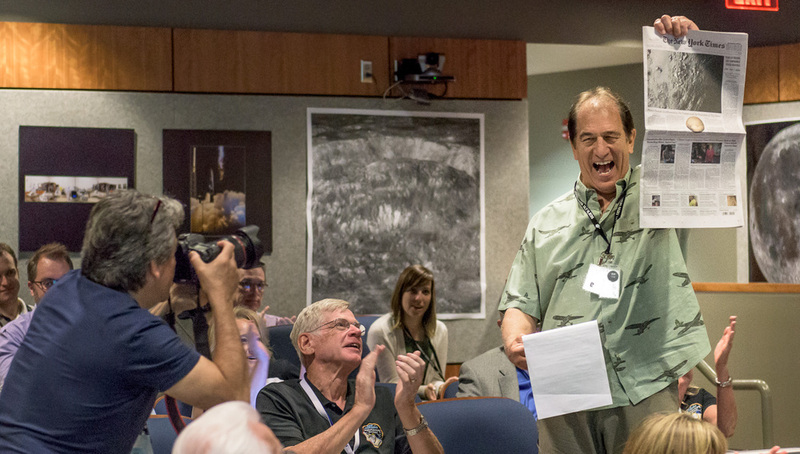 We knew that New Horizons would be a historic mission scientifically. But we also knew it was important to document the human side of the encounter—the successes as well as frustrations. Just as we remember Neil Armstrong’s words and the shaky video from the surface of the moon, we knew that our team members’ activities would also form their own historical record. APL, home of New Horizons mission operations in Laurel, Maryland, arranged for me and five other members of the science team to carry cameras as we worked. We were allowed access to the science working areas and public and press zones (though not mission operations, where flight controllers actually command the spacecraft). While I’ve spent years photographing around the world, there was nothing more exciting than to point my camera at my friends and colleagues on this epic journey to the frontier of the solar system. Below are some of my favorite images. Although New Horizons had been in flight for over nine years, it was only two weeks before the Pluto encounter that we first detected Pluto with LEISA, the spacecraft’s near-infrared spectrometer. In the image above, members of the Composition team compare their three independent analyses of the spectrum, which showed the very first detection of water ice. Why three different models of the same thing? Just like an airplane has multiple altimeters, we wanted to be sure that we weren’t deceived by errors in any one model. 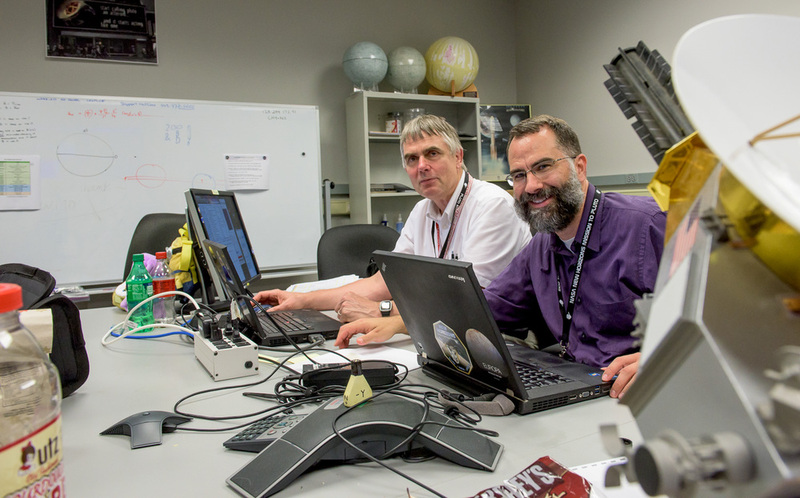 In the Payload Engineering room, shown above, Maarten Versteeg and Tommy Greathouse work with data from the Alice ultraviolet spectrometer. 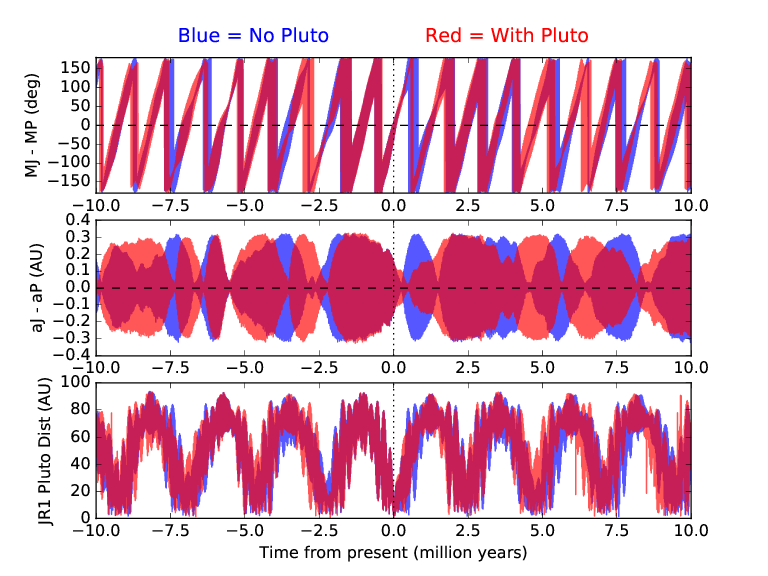 This was taken 36 hours before Pluto close approach, and the instrument had sent back its very first spectrum of Pluto. Up until now, this instrument had been too far from Pluto to detect it. In addition to the snacks keeping the team going, there are two New Horizons models here. At right is the detailed scale replica. But the more frequently used one is the small yellow model on the speakerphone, marked with the rotational axes we use to point it. A typical observation might be “Point +X toward Pluto, roll -Y to north, and then do a 30-degree scan around -Z.” We used models like this frequently when planning observations. On the morning of closest approach to Pluto on July 14, 2015, the New Horizons team woke up earlier than normal so we could get our eyes on the highest-resolution “global” images that had been taken about 14 hours earlier. Two members of the team worked overnight to process them in time for our team meeting at 5 a.m. In the above photo, members of the science team see the young and un-cratered “heart” of the informally named Sputnik Planum close-up for the first time. On the day of encounter, New Horizons was busy observing Pluto, except for one short break to transmit a status update to the nervous team on Earth. This “phone home” signal was to be received around 8:52 p.m. EDT and was the emotional highlight of the encounter. Setting up a few shots of the signal’s arrival, I was focused on my colleagues (in the black shirts above the railing), and I didn’t pay much attention to the man in the suit below them. 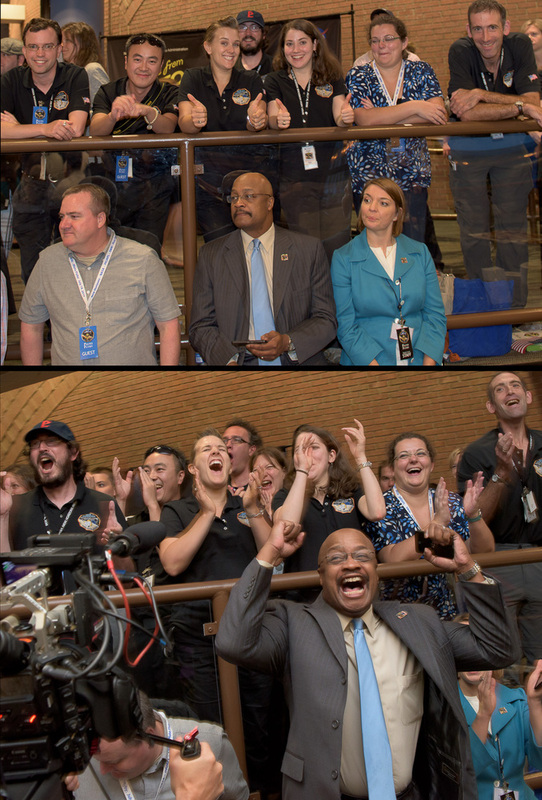 But that is NASA’s Senior Public Affairs Officer Dwayne Brown, and it was his reaction that really made this shot! A day after flyby, we received new images of Pluto’s largest moon, Charon. 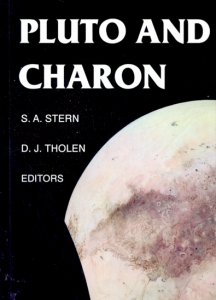 Charon was discovered in 1978 by Jim Christy. Christy suggested the name “Charon” – but he pronounces it with a soft “Sh” instead of a hard “K,” in reference to his wife, Charlene. 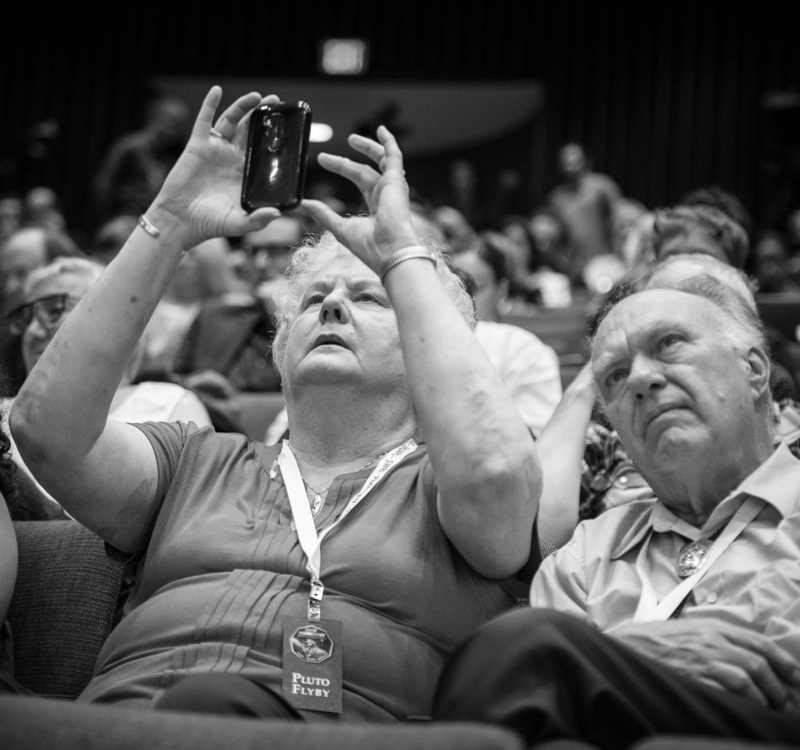 Jim and Charlene were at the front of the APL auditorium as the images were revealed. While Jim watched quietly, Charlene was taking photos of it all – she told me she was e-mailing them to her family as fast as she could. Our daily 8 a.m. science results meetings would often include an update on media coverage from David Aguilar, who led the team of writers assisting the science and public affairs teams with news and image releases. Here he reacts to our front-page New York Times coverage on July 16, 2015. Over the course of seven weeks, I took close to 10,000 photos. I’m grateful to APL and the mission for allowing us to document our extraordinary time exploring Pluto—both from afar, and here on Earth. 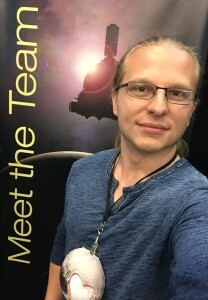 Jorge Núñez, a planetary scientist and engineer from the Johns Hopkins University Applied Physics Laboratory (APL), is the deputy systems engineer of the Long Range Reconnaissance Imager (LORRI) instrument on New Horizons. He studies the geology and composition of planetary surfaces using a variety of remote-sensing techniques. When not working on New Horizons or analyzing data from NASA missions, he also studies terrestrial analogs on Earth and develops new instruments for future planetary missions. As a young child growing up in Colombia and later in the U.S., I learned about the nine classical planets in our solar system. Four terrestrial planets: Mercury, Venus, Earth and Mars. Four gas giants: Jupiter, Saturn, Uranus and Neptune. And then there was Pluto, at the edge of our solar system. All of the planets had been visited by spacecraft except Pluto; it was unknown and unexplored. I never imagined that I would be part of the first mission to see this mysterious, incredible world up-close. 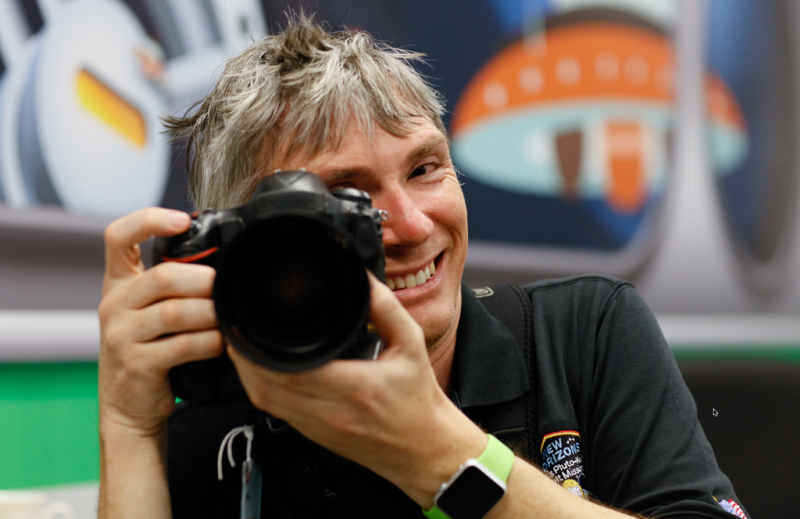 As the deputy systems engineer for the Long Range Reconnaissance Imager (LORRI) on NASA’s New Horizons spacecraft, my role is to help make sure that LORRI is healthy, works properly, and that its images are acquired successfully. In addition, I help to make sure that commands sent to the instrument are correct. LORRI is a panchromatic high-resolution telescopic camera composed of a telescope with an 8.2-inch (20.8-centimeter) aperture that focuses visible light onto a charge-coupled device (CCD). Similar to a grayscale digital camera with a large telephoto lens, LORRI imaged Pluto and its five moons from long distances during approach and mapped the surface of Pluto in unprecedented detail during New Horizons’ historic flyby on July 14, 2015. At closest approach, LORRI was able to image sections of Pluto’s sunlit surface at a resolution of about 70 meters, or roughly the size of a football field. After New Horizons came out of hibernation for the last time, in December 2014, LORRI began to acquire a few images daily. During the months before the encounter, these images were used to help the spacecraft navigate toward the desired flyby location and help scientists refine orbit calculations of Pluto and its moons. In addition, LORRI was used to look for additional moons and potential rings that could have posed a hazard to the spacecraft. New Horizons was flying so fast, at approximately 31,000 miles per hour (14 kilometers per second), that a collision with something as small as a grain of rice could have been catastrophic. As New Horizons sped closer, Pluto, which initially appeared as a small dot in LORRI images, grew to a system with multiple objects. 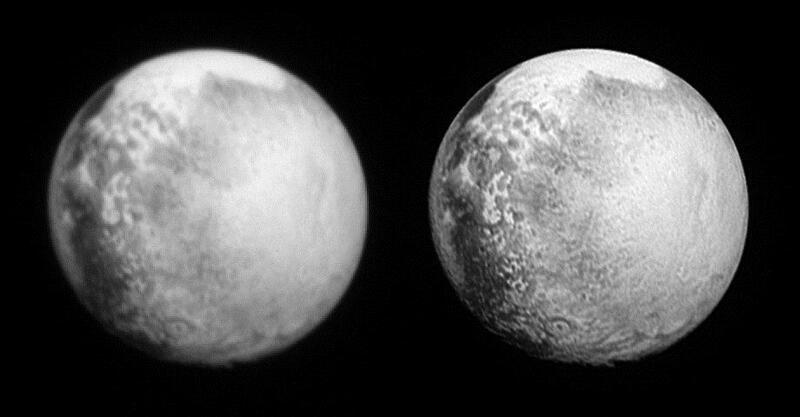 The complex surface features on Pluto and its largest moon, Charon, came into better focus. Each LORRI image was better than the next. 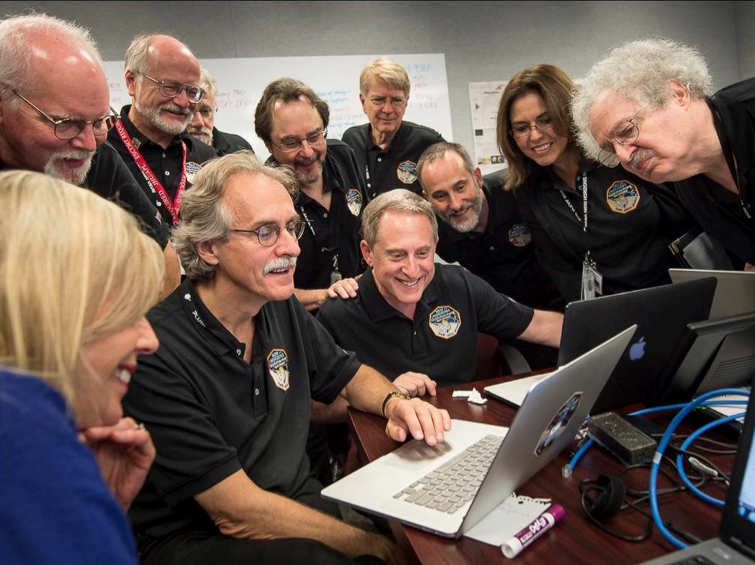 The team worked day and night to keep up with the data and images coming down with each transmission from New Horizons. LORRI images were posted on the New Horizons project website so the world could follow along in the excitement. On July 13, the night before closest approach, the last LORRI image before the encounter was transmitted to Earth. This was the best view of Pluto we would receive before New Horizons flew by Pluto. It became my responsibility and privilege to verify that the image came down properly before it was unveiled to the team and the world the next morning. When unveiled the next morning, the image became an instant icon. During the encounter of the Pluto system, LORRI worked flawlessly and acquired more than 1,800 images of Pluto and its moons during closest approach and flyby. Since the encounter, the stored LORRI images on New Horizons’ digital recorders have been coming down to Earth and will continue to come down through at least this September. They reveal a fascinating, complex world with a diversity of landforms like mountains made of water ice, and volcanoes and glaciers of exotic ice. More remains to be discovered. And LORRI’s mission is not yet over! The LORRI team is now preparing for the flyby of the Kuiper Belt object known as 2014 MU69. If NASA extends the New Horizons mission to accomplish this flyby, New Horizons will reach 2014 MU69 on Jan. 1, 2019. LORRI will provide the first close-up observations of an object thought to represent what the outer solar system was like following its birth 4.6 billion years ago. More mysteries to be revealed by LORRI and New Horizons await! 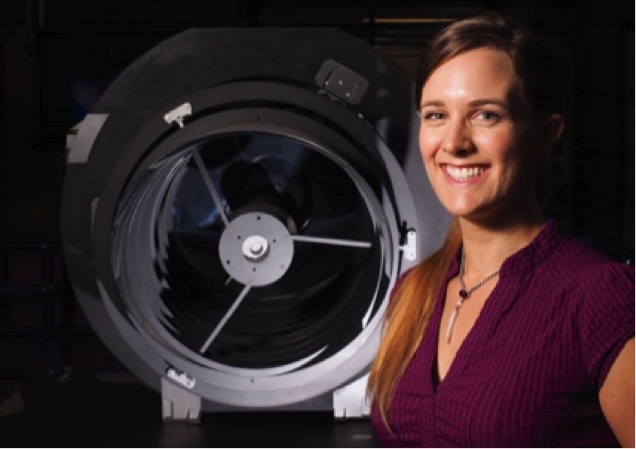 Today’s blog is from Veronica Bray, a planetary scientist at the Lunar and Planetary Laboratory in Tucson. She specializes in comparing the surfaces of planetary bodies across the solar system, especially through the study of impact craters. A spacecraft flies to Pluto, amazing images of this alien disk are sent back to Earth for us to enjoy, and suddenly scientists are telling us about what Pluto is made of—that it has different layers in its crust, that one part of the Pluto crust is weaker or stronger, or older or younger than another. How can that information be gained from photos? Well, in part the answer is that many other kinds of data—like compositional and atmospheric spectra – were also obtained, but this blog post gives one example of how the New Horizons team is using the spectacular images to investigate the surface of Pluto. As my specialty is impact cratering, you know what I’ll be talking about. When a comet or other object collides with Pluto, the speed of the impact is typically faster than a bullet. As a result, such collisions create an explosion that excavates a large hole in the surface—an impact crater. Depending on the size, speed and density of the impactor, as well as the near-surface properties of Pluto, the resultant craters can look very different from one another. As part of my work with the New Horizons team, I have been using the study of impact craters as a tool for investigating the physical properties of the Plutonian crust. I do this first by measuring the dimensions of different craters on Pluto from the Digital Terrain Models (DTMs), created from New Horizons images by my awesome team members! 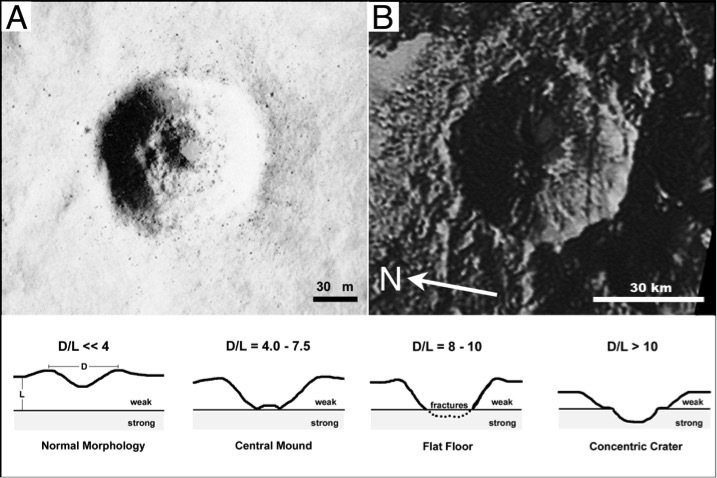 The figure below shows a topographic profile of the informally-named Elliot crater, whose namesake is the late Pluto researcher Jim Elliot of MIT. A) New Horizons image of Elliot crater, a ~ 56-mile (90-kilometer) crater in the informally-named Cthulhu region. The yellow line marks the path along which a topographic profile was drawn, from X to X’. Depth (d) and Diameter (D). When measuring a newly formed crater, a lower depth/diameter ratio can point to a weaker or warmer target surface. The depth/diameter value (and the other crater dimensions listed below) is also affected by the gravity of the target body and the age of the crater, as craters tend to shallow with time. So, depth/diameter can also be used to gauge the relative age of the different craters on Pluto. The central peak height (Hp) and width (Dp). These can tell us about how much uplift of material from depth has occurred at the impact site. When I compare this ratio to the uplifts seen in other craters across the solar system, I can tell whether the Pluto near sub-surface is weaker or stronger than on other bodies. I can also compare central peak craters across Pluto: two craters of the same size with different central peaks might be telling me that the one with the larger peak was formed by a higher velocity impact, or that the Pluto surface is weaker or warmer in that location. The height of crater rims (measured from the surrounding terrain level). This offers indirect evidence of the extent of crater wall collapse. When comparing two craters of the same diameter, a lower rim height suggests that more collapse has occurred and might point towards the upper levels of the Pluto crust in that area being weaker than for areas with greater rim heights. The average slope angle (d/W). Although the walls of craters can be complicated, including scarps, terraces and scree slopes segments (all of which can provide their own information on the material strength and target structure), we can also gain knowledge from a more simple measurement: the average slope angle, as it is a proxy for the ‘effective’ coefficient of friction during the process of impact crater formation. Crater Diameter of ‘benched craters’ can be used to estimate the thickness of layers – as seen in the figure below – within the Pluto crust. This is an especially exciting crater dimension to study as it gives a specific value – the upper layer thickness. We can then start to hypothesize on why this layering is there. Is it deposition from the atmosphere, snowing down on the surface? Is it bombardment from the solar wind breaking down the upper layer of the crust to make a regolith, like we see on the moon? I’m currently measuring crater dimensions on Pluto and other icy bodies so that I can compare them to one another and also to existing measurements of craters on rocky bodies such as Earth’s moon. Once I have these measurements and the topographic profiles in hand, I can also use them to compare to my computer modelling results in which I simulate the impact process in various targets (different materials, different sets of layers, whatever I want). There are thousands of craters on Pluto waiting for me to measure them. I’d better get started! Quaide, W. L. and Oberbeck, V. R. 1968. Thickness determinations of the lunar surface layer from lunar impact craters. J. Geophys. Res. 73:5247-5270. PDF Here. Osinski, G. R. and Pierazzo, E. (2012). Impact cratering: Processes and Products. ISBN: 978-1-4051-9829-5, 330 pages, Published December 2012, Wiley-Blackwell. Melosh, H. J. 1989 Impact cratering: a geologic process. 245 pages, Oxford University Press. 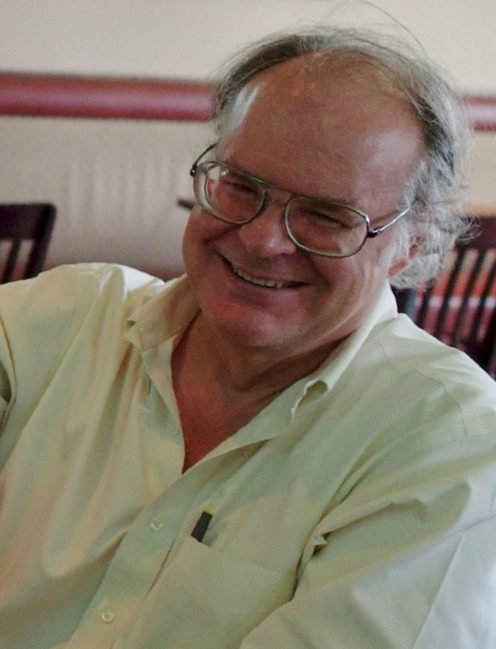 Today’s blog is from Dr. Henry Throop, a planetary scientist with the Planetary Science Institute in Mumbai, India. He received his PhD in 2000 from the University of Colorado, Boulder. His areas of research include the outer solar system, the rings of Jupiter and Saturn, and planet formation in the Orion Nebula. 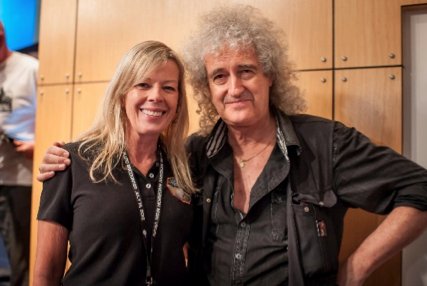 He has been working with the New Horizons mission since 2002. New Horizons traveled for 9.5 years to get to Pluto. But most of the spacecraft’s key Pluto system observations were taken within a single 24-hour period. How did we make sure that we get the best observations possible — to do the best science in those 24 hours? Well, it took a lot of planning. When astronomers are using telescopes on the ground, observing is sometimes unplanned, and conditions vary as the night moves along. Perhaps the images from an object are particularly interesting, so we take more. Or the weather is changing, or an instrument is not working right, and we move to a new target or new instrument, improvising along the way. But for the Pluto encounter, there was no possibility of this. With only a single day to gather the once-in-a-lifetime datasets about this new world and its moons, we wanted to squeeze in all of the observations we could. Single images, mosaics, wide scans, spectra, radio occultations and more—all had to balance out to maximize the overall science. The observations were packed so densely that we would have no time to effectively improvise in real-time. And, more importantly, with a 9-hour round-trip light time between New Horizons and the ground, it would simply not be possible to take some images, send them down, and then decide to take more observations from the most interesting area. Instead, the entire encounter had to be sequenced in advance. Putting the observation plan together took several years of meticulous planning, and the final observing program was to be uploaded to the spacecraft about 10 days before encounter. About a week before flyby, that observing plan started executing—firing off a sequence of turns, snaps and scans that would execute the science program. So how does the science team choose where to point? You might say, “Just look at everything!” But during the central 24 hours, our view of Pluto would be constantly changing: different distance, different face, different solar angle, and so forth. We needed some way to simulate what the view from the spacecraft would look like, and determine where we should aim our instruments. How much of Pluto could we see? What surface locations (longitude, latitude) would we be crossing over? What stars would be in the background? Which hemisphere of Pluto would be visible and at what resolution? This is where one of my roles in the mission comes in. 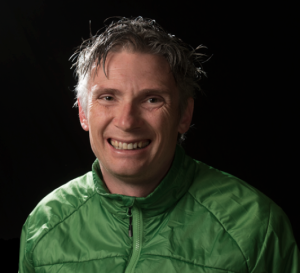 I am the developer and maintainer of GeoViz, which is the software tool the science team uses for planning observations. You can think of GeoViz as essentially a sophisticated and very accurate planetarium program – a ‘Geometry Visualizer’ – that shows the sky and planets as they appear on a given date. It gives you the view not as if you were standing on Earth, but as if you were on the spacecraft. Want to know exactly when Charon will pass behind Pluto? Just ask GeoViz to plot it. 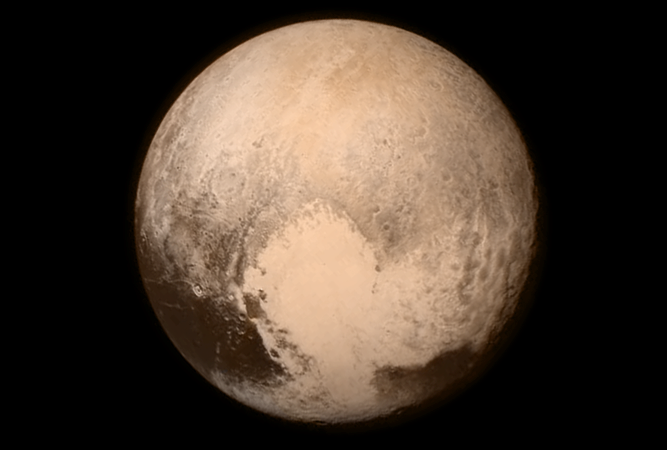 Need to know how many LORRI images will fit on a mosaic across Pluto at T – 3 hours? GeoViz will show you. Want to get a list of the bright stars that our Alice instrument will scan during a calibration observation, and make a movie of the scan? GeoViz will work this out as well. It is a web-based program to simulate observations, showing the geometry of the solar system, and how it fits in with the spacecraft’s various instrument fields. My background is as an astronomer, not a programmer. But I and many astronomers spend much of our time as programmers: writing code to automate data analysis, perform simulations, or run instruments or mosaic images together. 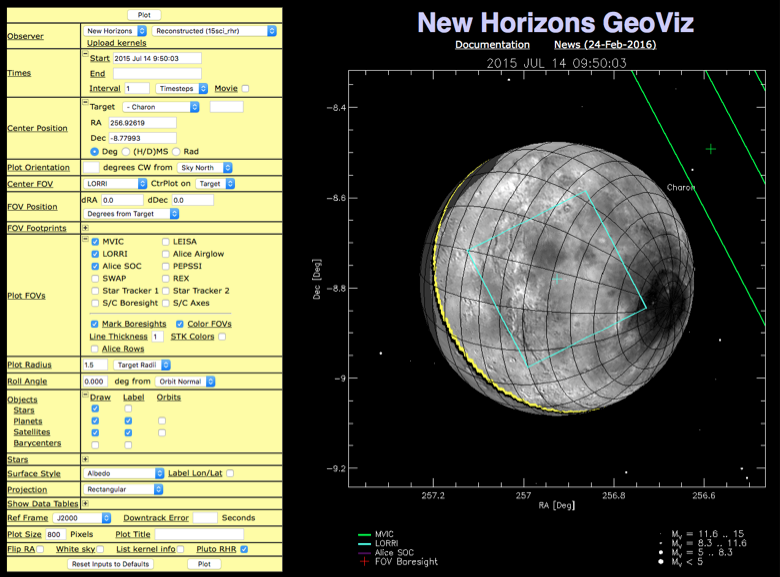 I started GeoViz as a way to automate figures I was producing for New Horizons’ Jupiter flyby in 2007. Since then I’ve been developing it into the powerful, general-purpose planning tool that it is now. What were the biggest challenges? The first was to keep it simple to use, while still adding the new features that the science team requires. GeoViz is widely used because it works well, and it has a clear user interface. There are hundreds of different options internally, but the interface design is kept clean enough so that it’s not overwhelming. The second challenge was to keep it running. GeoViz doesn’t communicate with the spacecraft directly, and is not ‘mission-critical.’ But during the encounter the science team was using it heavily, and we didn’t want it to go down, nor did we want a newly added ‘feature’ to turn out to have unforeseen side effects. We addressed that by keeping two versions of it: a ‘stable’ version that was only rarely updated, and a ‘development’ version with the latest features. When I started working on New Horizons at SwRI, I was living in Boulder, Colorado, where much of the rest of the team was located. But my wife works as a diplomat, and her job takes her around the world. After being in Boulder for several years, we moved to Mexico, and then South Africa, and now we are living in India. 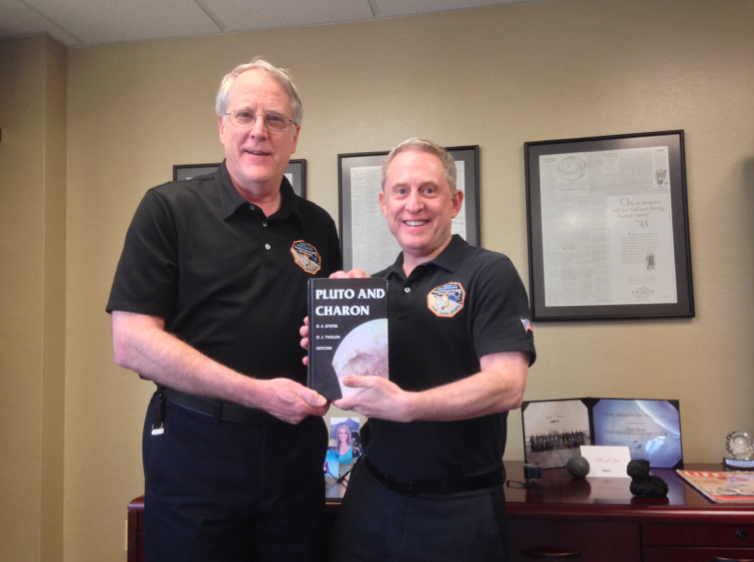 Most of my work on the mission can be done remotely: with Pluto about 3 billion miles (5 billion kilometers) away, the fact that I may be on the other side of the Earth is a relatively small difference. 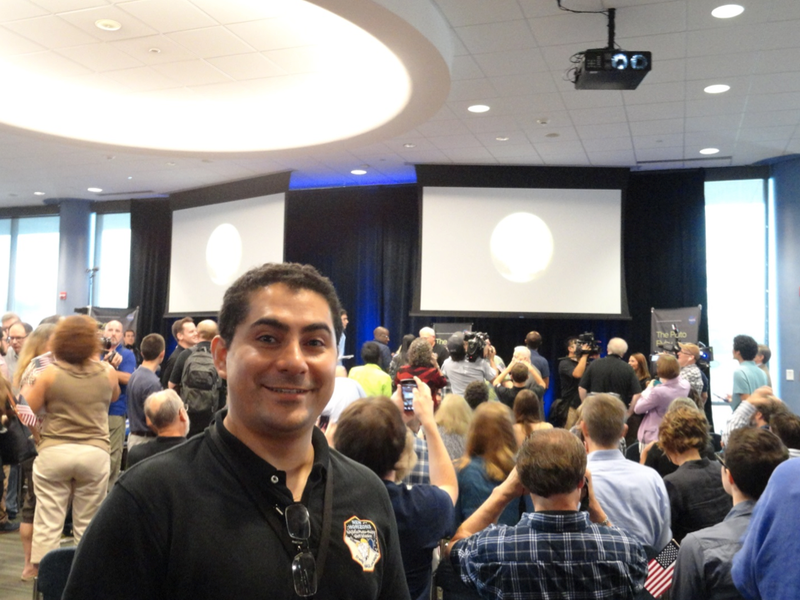 For the flyby itself, I came back to the U.S. and spent two months working closely with my colleagues on the team. After ten years of working on the project – much of it remotely – I wasn’t going to experience the flyby over a speakerphone! 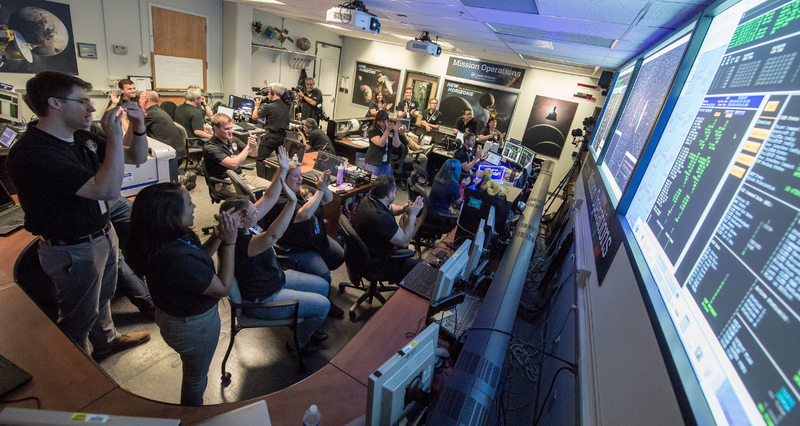 There were a lot of long nights at APL preceding the encounter and a few tense days as we closed in, followed by one of the most exciting moments of my life: listening with the world to Mission Operations Manager Alice Bowman, as she calmly polled her team of engineers before announcing the spacecraft’s successful passage through the Pluto system. Now that I’m back abroad now, living in India gives me a great chance to talk about New Horizons, NASA, and Pluto to audiences around the world. I’ve given nearly a hundred public talks and lectures about the mission to audiences in Africa, Latin America and Asia. Some of the most rewarding talks were at rural schools in South Africa. The science team members remain heavy users of GeoViz. It continues to be used post-flyby, not to plan observations, but now to help analyze them. (“Where was the spacecraft pointed for this image? 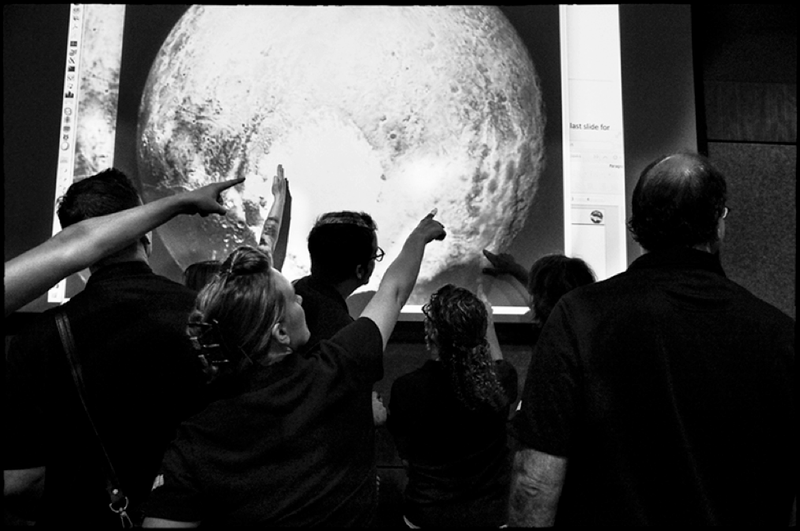 Is that bright object Pluto’s moon Nix or a star?”) Working with the team has been one of the most rewarding experiences of my life – it’s amazing to think that all this planning paid off in getting us to Pluto. We really did it!